Saturdays 7th, 14th, 21st and 28th of the month of April. At Deriva Mussol, we walk the perimeter of villages and towns in order to capture their presence and intensity from the boundaries that border them. The physical action of walking offers us new languages of measurement, observation and analysis which come together in the course of stepping out. We walked the perimeter of Sabadell with the collaboration of the Laboratori Social Metropolità, from Sabadell itself, and we have explored a few town and village perimeters around the region, such as Vic, Manlleu and Torelló, the latter, accompanied by the group Morir de Frío. Following the direction of the railway line heading north, we propose a series of new perimeters, linked by the edges of the railway stations which climb from Vic to the Pyrenees. 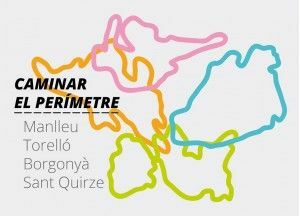 The first series will include the towns of Manlleu, Torelló, Borgonyà and Sant Quirze de Besora, and will be held consecutively on Saturdays 7th, 14th, 21st and 28th of the month of April. Deriva Mussol are Jordi Lafon and Eva Marichalar-Freixa in collaboration with the participants in their proposals. Their interest in walking and derive arises from their respective career paths in the visual arts, performing arts and education, as way of exploring possibilities for creation and learning in contemporary contexts. Deriva Mussol attempts to generate actions and share spaces that are open, permeable and moving. Deriva Mussol is part of ACVic Centre d’Arts Contemporànies de Vic project nursery, and Caminar el perímetre is supported by ACVic’s in organisation and publicity.